A statewide debate over how best to deal with schools where large numbers of students boycott state tests has taken a new turn, as teachers union leaders allege that proposed new regulations represent a “frontal assault” on parents’ efforts to opt their children out. 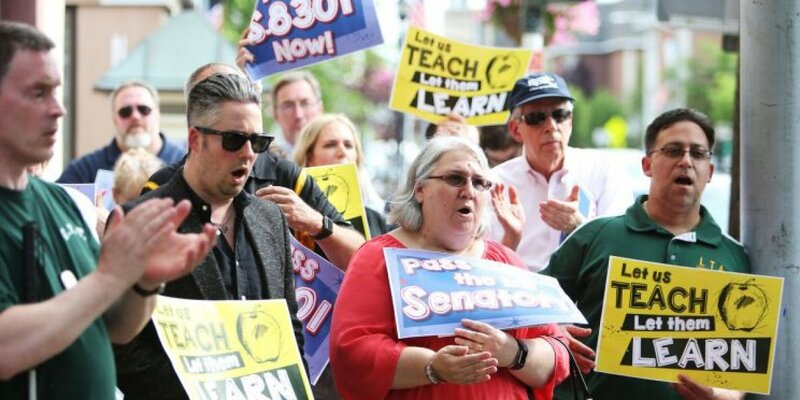 New York State United Teachers, an Albany-based union umbrella group, issued a letter criticizing proposed new financial penalties and other sanctions for school districts that do not maintain student test participation rates of at least 95 percent. The great majority of districts in Nassau and Suffolk counties do not meet that standard, set by federal law. The testing dispute resonates on Long Island, where more than 50 percent of eligible students in grades 3 through 8 opted out of state English Language Arts tests administered in mid-April. The region has emerged as an epicenter of the boycott movement over a six-year stretch. The union letter was addressed to state Education Commissioner MaryEllen Elia, who later said during a Newsday interview that NYSUT and other educational groups had been consulted before the state regulations were drafted. The regulations would restrict the way that penalized districts spend federal Title I dollars by requiring them to set aside money to be used in encouraging greater student test participation, according to union analysts who have reviewed the 95-page regulatory document. Details on the amount of money to be set aside would be worked out after the regulations passed, education experts said. In addition, analysts said, the proposed rules would change the way test-participation rates are factored into schools’ overall academic ratings, making it more likely that schools would be classified as scholastically deficient. This could pressure reluctant parents into allowing their children to be tested, NYSUT officials said. The disputed regulations, posted last month by the state Education Department, are intended to meet requirements of the federal Every Student Succeeds Act, which was approved in 2015. New York State’s Board of Regents is tentatively scheduled to take up the regulations for adoption at its next meeting June 11-12.